I'm so over this bad weather and I'm just craving sunshine. 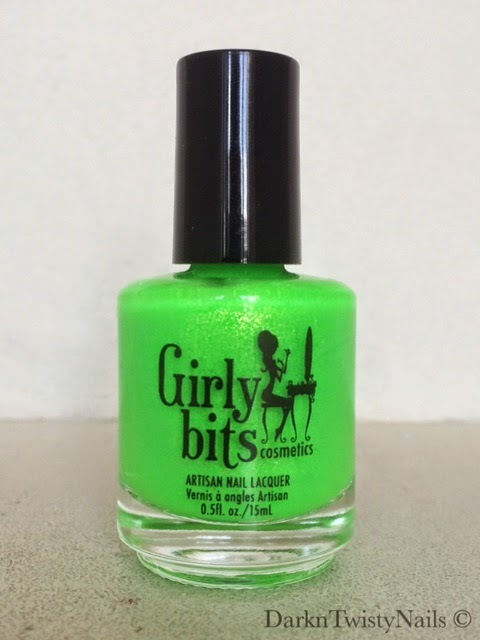 If I can't have it outside, I'm just going to have to paint it on my nails. 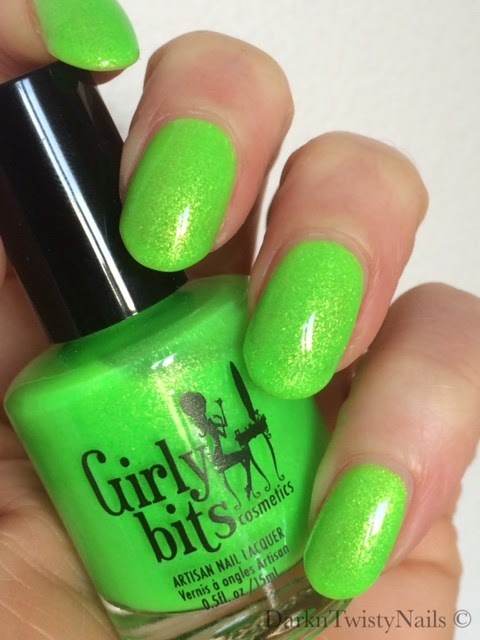 Girly Bits Glow Worm is a bright, in your face lime green jelly base with a glass fleck shimmer. It was released as part of the 2012 Slapdash collection and has since sadly been discontinued. The formula is really nice, it's easy to paint and dries really fast, The only problem I have with it, is that it's really sheer because of the jelly base. 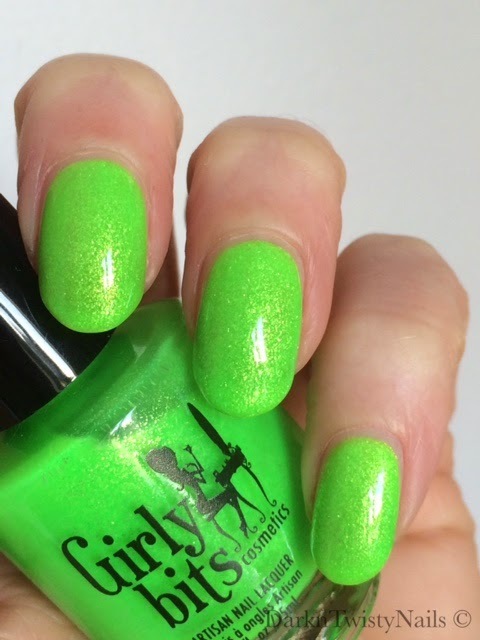 You can get this opaque on its own, but you'll need about 4 - 5 coats to not see your nail line. I've used 3 generous coats in these pictures and you can still make out my nail line. I don't mind that too much, but if you want a fully opaque look, I'd suggest layering 1 - 2 coats over a white base. This was on my wishlisht for quite some time, but I never picked it up. That is untill I heard it was going to be discontinued. I checked online to see if it was still available and it was already sold out on all the sites, except for 1 (I don't remember which though...), but they only had 1 bottle left. It was in my cart and paid for so fast, a friend I was chatting to that really wanted it too missed out on it. But seriously, can you blame me? It's such a fun color, just try not to feel happy when you look at it, go on, I dare ya! It's just not possible. 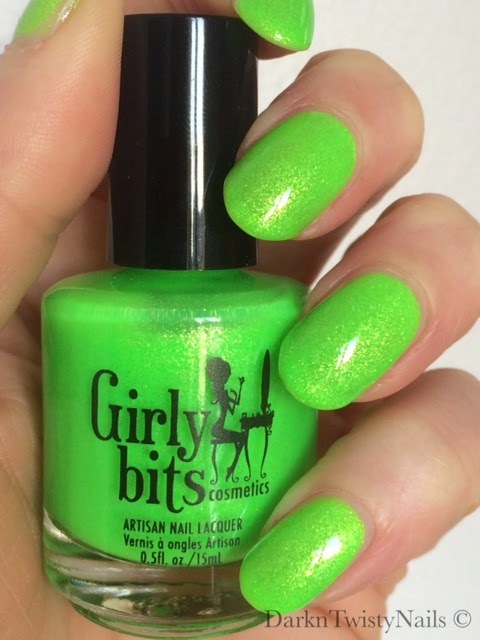 Girly Bits is available on their website or you can get them at Llarowe or Harlow&Co. Are you brave enough to rock a bold in your face color like this or do you go for more muted colors? Nice color!! Looks great on you! Hij is zeker fun zeg! Echt super fel kleurtje, leuk! Love, what a stunner, looks great on you! Ik ben ook zooo blij dat ik hem nog heb kunnen krijgen!